Who wants to run a 5k? Me neither! Let’s face it, many of us dream of running in such a mini marathon, but between our busy schedules and our fear of how we will perform, we just can’t muster up the courage to sign up. However, the Houston Museum of Natural Science is changing all of that with our Dino Dash virtual 5k. Now you can race at your own pace, all you have to do is follow this LINK to our sign up page. Sign up starts June 1st. Pay an entry fee of $35 for nonmembers and $30 for members, make a pledge to run anytime between June 15th and July 15th, walk, hop or skip 5 kilometers and you will receive this awesome medal! Virtual 5k’s have become a popular motivator for people who want to be more active but just don’t know where to start. You can complete a virtual 5k on the road, at the park, on the treadmill or at work. It doesn’t have to be finished in one day, you can take as much time as you like. The goal of the activity is to help people discover opportunities in their daily routine to get in a little exercise. Our Vice president of Education, Nicole Temple, along with Carolyn Leap, our Science on Stage Staff Manager measured how far you have to walk to see all the exhibits at HMNS. It turns out that each visitor walks about a mile to get though our entire facility. Not long after the blog was published, a group of HMNS employees formed a museum walkers club. It goes to show that in our everyday lives we are surrounded by missed opportunities to engage in a little exercise. I remember when I was 15 years old, and a bit overweight, my parents started encouraging me to get a little bit of exercise every day. I tried to muster up the will power incorporate physical activity into my daily routine, but after a week or so I always gave up because I felt like I wasn’t accomplishing anything. That’s the thing about exercise: gratification comes slow and many people become disenchanted with a routine that seems to take your precious free time while giving no apparent reward in return. The truth is, however, that every little bit does help. The Center for Disease control recommends 150 minutes of moderate activity a week. That’s less than thirty minutes a day. By moderate, they mean a brisk walk, just enough to get the blood pumping but not so much that you’re on the ground wheezing after two minutes. Staying active is not as hard as it seems. If the Ancient Greeks found time for exercise, you can too! 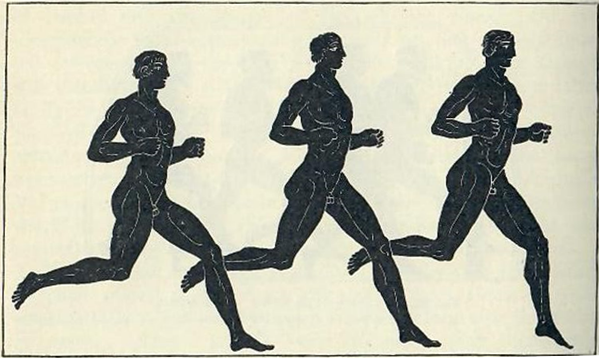 A scene depicting long distance runners, originally found on a Panathenaic amphora from Ancient Greece, circa 333 BCE. Source: Wikimedia Commons. In recent years smart pedometers like fit bit have encouraged thousands to take a little time out of their day to get in some extra steps. The gratification of seeing how far you’ve really gone helps walkers visualize their progress and stay motivated. Probably the most important thing to keep in mind when trying to become more active is that the true goal is not to walk 10,000 steps, or be able to run a marathon by March, it’s just to become more active than you were before. Don’t set lofty goals for yourself, just try to walk a little further each week, you’ll be surprised what you can accomplish. By keeping this in mind and focusing on breaking my own personal records rather than trying to keep up with my friends who were in better shape, I was able to lose 70 pounds in about a year and a half. 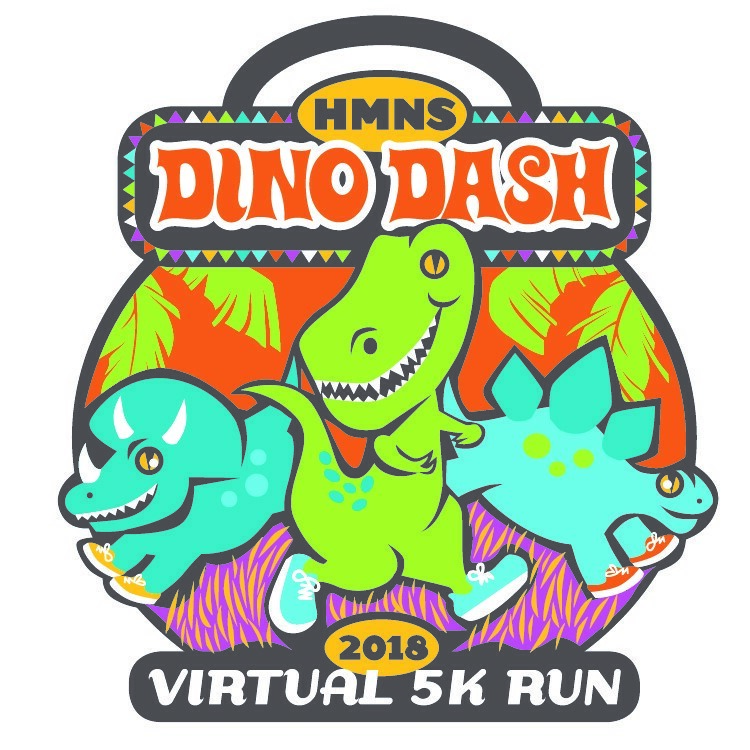 For anyone out there looking for that extra motivation to get active, or even someone who is already active and just wants something to show for all the effort they’ve put in, our Dino Dash virtual 5k is just what you need. The novice can discover how adaptable an active lifestyle can be to their normal routine, while the veteran can set an even higher goal for themselves, maybe try running the whole 5k in one day. Either way, you can wear you awesome medal with pride and serve as an inspiration to you friends and family. Ready, set, STEM! 2016 HMNS Outreach programs focus on physical fitness!